This post has been sponsored by Kroger. As always, all thoughts and opinions are my own. 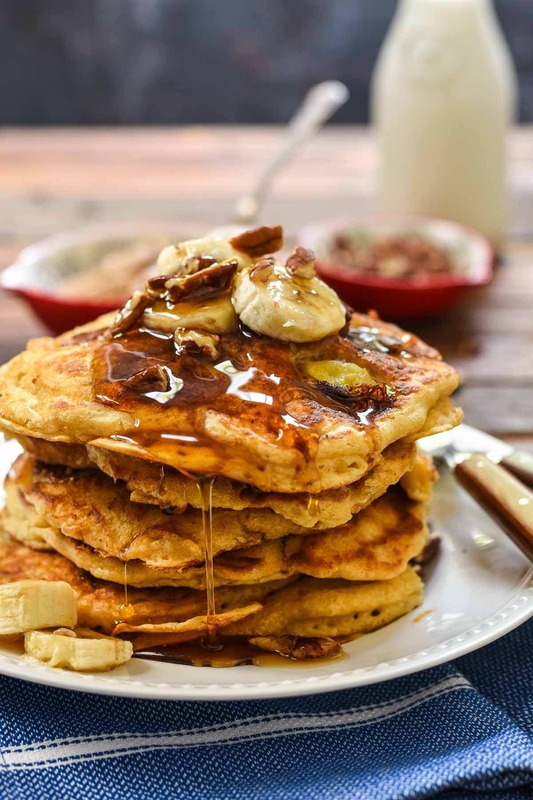 Cozy up this holiday season with a big plate of Banana Pancakes smothered with maple syrup and toasted pecans. If it were possible to live in my Christmas PJs every day until the New Year, I totally would. Maybe I’d make a brief exception for an Ugly Sweater party, but that’s the extent of my pants-with-a-button-wearing for the year. It is the season of comfort and joy after all, and nothing says comfort like an elastic waistband. Pass me a giant mug of cocoa, my fuzzy slippers, and a cozy sweater. Some Christmas cookies for dunking into aforementioned mug o’cocoa couldn’t hurt either. I love this season so much, but too often I have crammed it with so much stuff that I arrive at Christmas exhausted and out of breath. That’s not what I want. All the parties and pretty decorations and perfectly wrapped presents are worthless if I’m too tired and stressed out to enjoy them. So this year, I’m dropping out of the race and choosing snuggles instead. I’m trading the rush for rest and reflection, the busy mornings for pancakes and PJs. Pancake mornings are way up there on my list of favorite things, and banana pancakes, well, they’ve got such a reputation someone wrote a song about them. Waking up slow, and all that jazz. Many of my happiest moments are spent in the kitchen on a lazy Saturday morning. Me, standing at the skillet with melted butter and a spatula. My love, making coffee a few feet away. And my littlest love toddling around, ripping dish towels out of drawers or eating hair balls he found under the kitchen island. Just keeping it real. Pancake mornings are great, but I never said they were perfect. 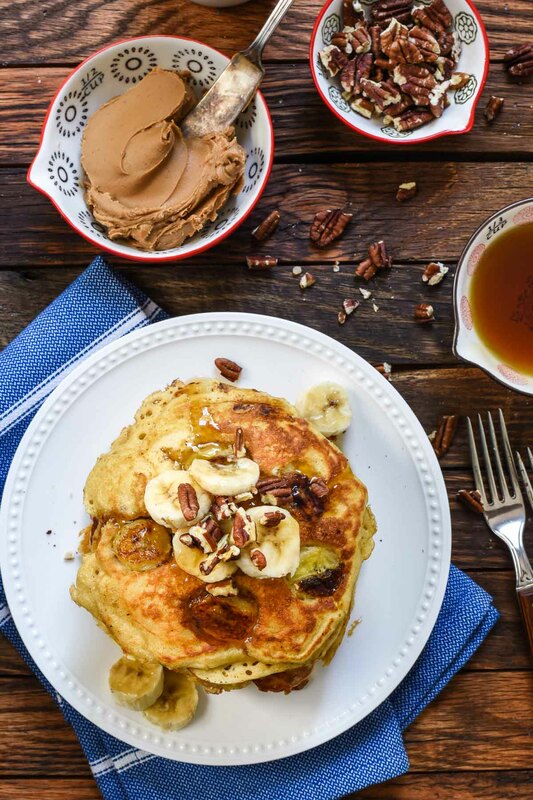 These banana pancakes really are something special. 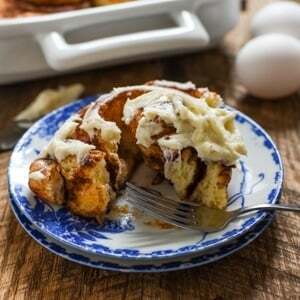 Banana slices are nestled into sizzling butter and covered in my fluffy buttermilk pancake batter. The pancakes puff and bubble, such a lovely sight. When they’re flipped, the bananas are soft and caramelized and impossibly sweet. 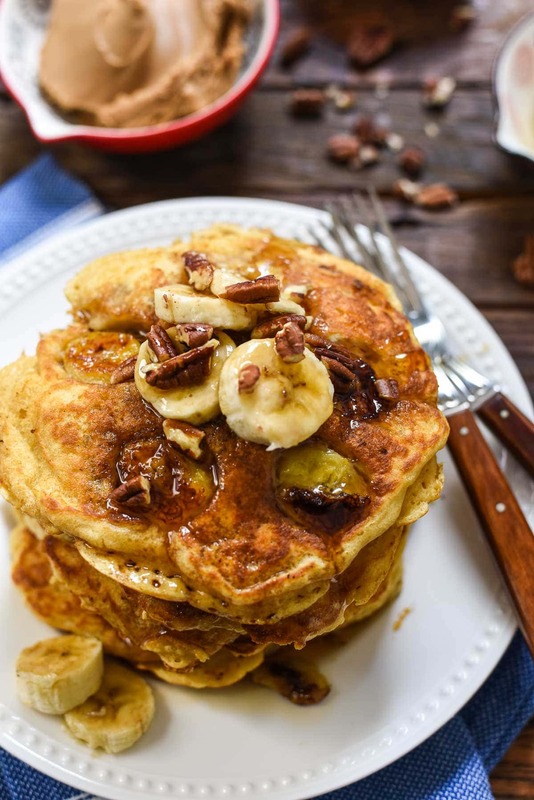 I serve them up with plenty of real maple syrup, fresh banana slices, and toasty pecans. I also like to add a spread–either peanut butter or Biscoff (the biscoff is my FAVORITE)–because it’s the holidays, and the holidays deserve a spread. 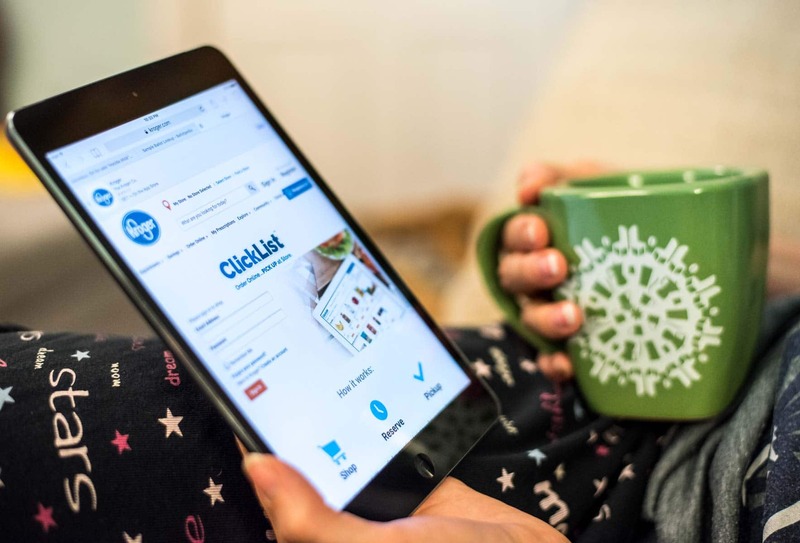 I am so on board with anything that will help me get more snuggles and PJ time this holiday season, which is why I am in love with Kroger’s new ClickList service. ClickList allows you to order your groceries online, wrapped in a cozy blanket with your slippers on and a hot beverage in one hand. 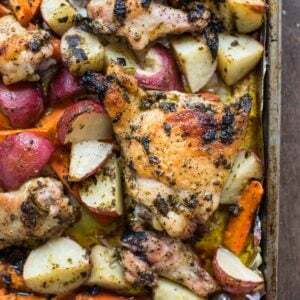 I was able to order all the ingredients for this recipe–they have everything from baking supplies to fresh produce and meats. After ordering, you schedule a convenient pick up time, drive to the store, and wait for the grocery fairies to bring you your goods. You never even have to leave the car, which also means you never have to leave your PJs. The only question is what you’ll do with all your extra lounge time. Might I recommend pancakes? In a dry skillet, toast the pecans over medium heat until fragrant, about 2-3 minutes. Set aside. In a medium bowl, whisk together flour, sugar, salt, soda, and baking powder. In another medium bowl, whisk together egg yolk, butter, buttermilk, and milk. Add yolk mixture to dry mixture and stir gently until barely combined. Add egg white to the mixture and stir until a thick, lumpy bumpy batter forms. Stop before the batter smooths out! The egg white may not even be all the way incorporated. That's okay! We like lumps and bumps in our pancake batter. Heat a griddle or grill pan over medium heat. Melt some butter in the pan. Place 4-5 slices of banana in a circle on the griddle for each pancake. Ladle the batter on top of the pancakes, covering completely. Cook until bubbles start to appear on the exposed surface of the pancake. When bubbles appear, flip pancake and cook for an additional 2-3 minutes or until browned. Sometimes the bananas get a little mangled in the flip. Don't fret, it'll still be delicious! 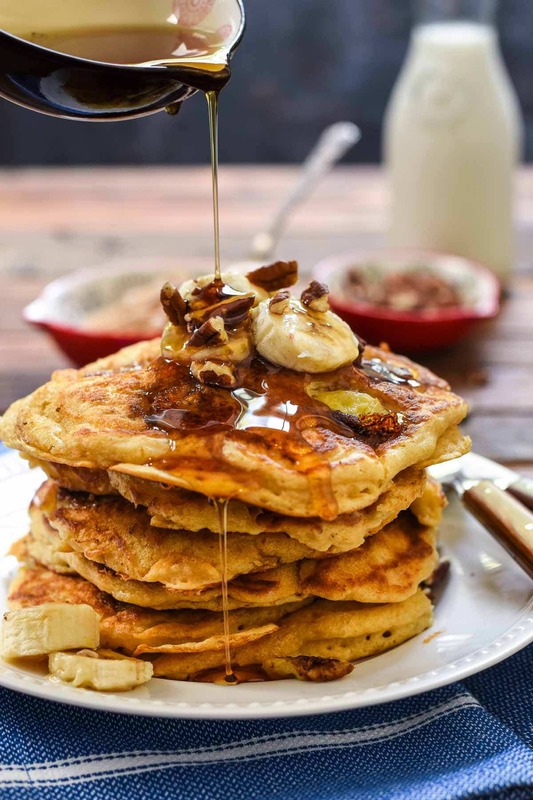 Keep finished pancakes warm in a single layer on a baking sheet in an oven preheated to 200 degrees or serve immediately with peanut butter or biscoff, toasted pecans, and warm maple syrup. I so agree with everything in this post… Especially the idea of living in PJs until the new year. That’s ALL I want in life right now. Aside from these pancakes. Banana pancakes and PJs all day long. YES, PLEASE!! Oh I’m definitely going to give these a try! My 3 year old loves bananas AND he loves pancakes. He’s going to be over the moon. “choose snuggles instead” is my new life motto. Love this Courtney! !